Apple Cinnamon Sprouted Granola by Go Raw is very taste and no added sugar only what it gets naturally from the dates. Apple Cinnamon Sprouted Granola made with Hemp Seeds by Go Raw is delicious, crunchy, and great over greek yogurt. I will definately order again. 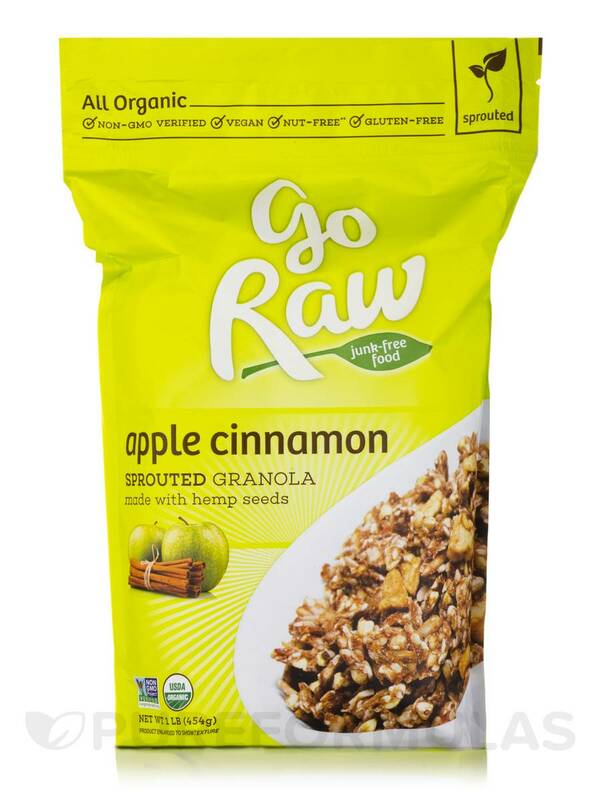 Organic Apple Cinnamon Granola Cereal by Go Raw is another one of my personal favorites. The taste is great and everything is raw!! You can't beat it! Apples and cinnamon are a favorite at breakfast‚ which is why Go Raw combined them both into a premium granola. Chewy dried apples give this hearty‚ cinnamon-dusted granola a wonderful texture and makes it a great snack any time of the day. Are you gluten free and missing your favorite apple-cinnamon oatmeal? Look no further‚ especially if you need fuel for exercise. Apples boost endurance with quercetin‚ and cinnamon enhances brain function‚ memory and circulation‚ and both help our granola taste delicious. Plus the bag also contains hemp seeds‚ an additional source of protein‚ and they contain all 20 amino acids‚ including the nine that our bodies cannot produce; and buckwheat groats‚ a fantastic source of fiber and protein. - Made with hemp seeds. - Excellent Source of Fiber. - Good Source of Protein. 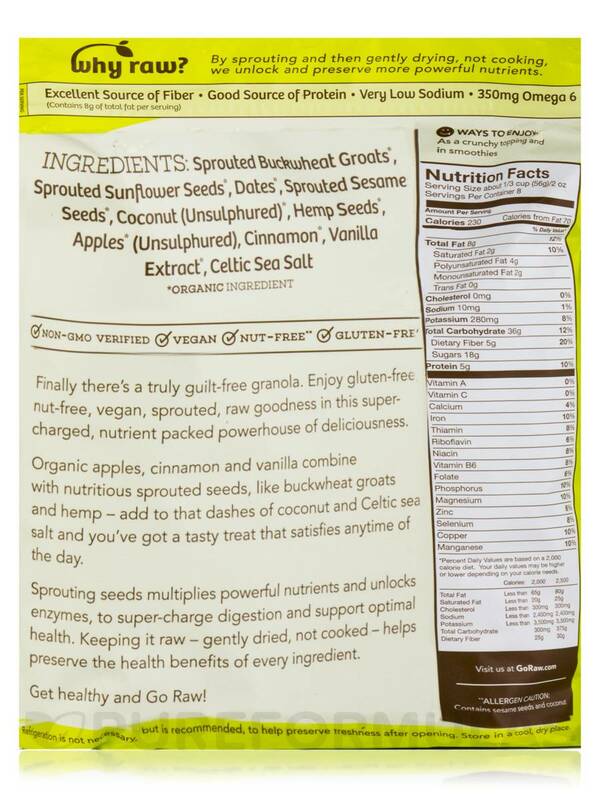 Ingredients: Sprouted buckwheat groats**‚ sprouted sunflower seeds**‚ dates**‚ sprouted sesame seeds**‚ coconut (unsulphured)**‚ hemp seeds**‚ apples** (unsulphured)‚ cinnamon**‚ vanilla extract**‚ celtic sea salt. 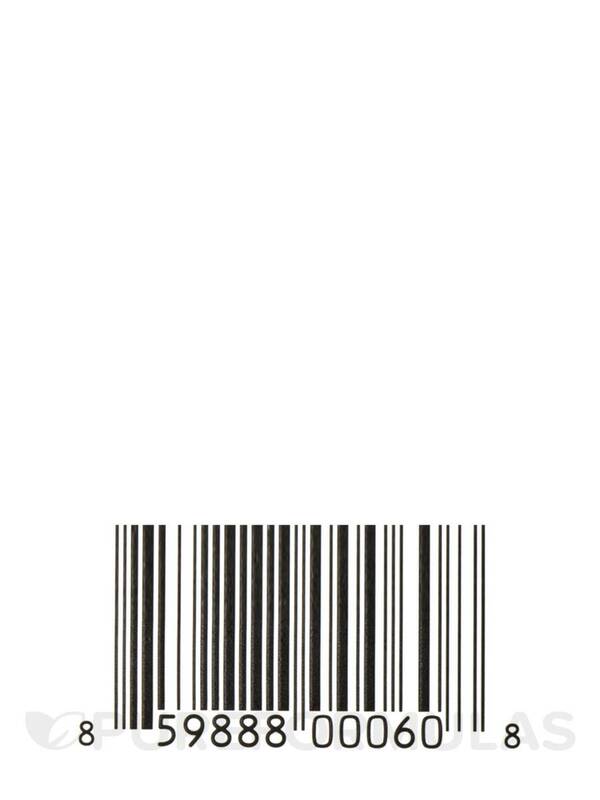 Non-GMO Project Verified / USDA Organic / Certified Vegan / Certified Gluten-Free / Nut-Free. Contains sesame seeds and coconut. Refrigeration is not necessary‚ but is recommended‚ to help preserve freshness after opening. Store in a cool‚ dry place. I love Sprouted Super Simple Seeds by Go Raw it has a great cinnamon flavor. I like that it can be eaten by itself. 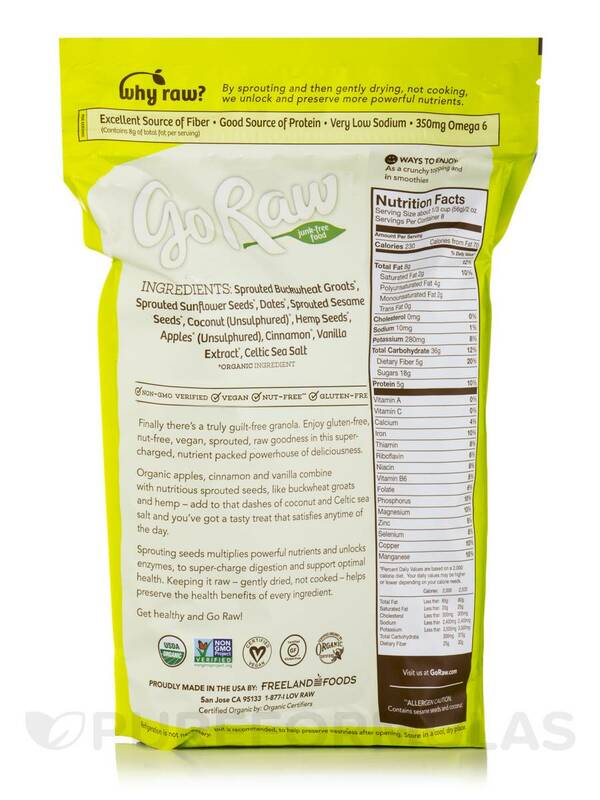 Wow, I want to keep eating Organic Apple Cinnamon Granola Cereal by Go Raw and not stop. Im allerice to dairy, and gluten, and nuts, and I can eat this cereal. And its raw, so its nutritiously packed with alive foods! I love Organic Apple Cinnamon Granola Cereal by Go Raw. Its crunchiness gives texture to the plain yogurt for my lunch. It is hardly sweet at all. Just what I like. But if you want more sweetness, just add yacon syrup. Yummy! I also like to eat it as snack - just a handful is enough. Organic Apple Cinnamon Granola Cereal by Go Raw was so good it had just enough apple and cinnamon flavor you can eat it with almond milk or use it in yogurt its so good you can't go wrong. Organic Apple Cinnamon Granola Cereal has a great flavor and just the right amount of crunch!